Beowulf misused as history Tolkien claims that up to his time Beowulf has been recognised as important by critics and historians but consistently misinterpreted. By historians, philologists, archaeologists etc it has been mined for information about Germanic customs and religion and clothes and warfare. But Beowulf is not a historical document: it is a poem, a work of art. Its very success as a poem has created the sense that it is historical when, in fact, the most recent research tends to highlight (as with Shakespeare’s treatment of history) only its inconsistencies and cavalier approach. So far from being a poem so poor that only its accidental historical interest can still recommend it, Beowulf is in fact so interesting as poetry, in places poetry so powerful, that this quite overshadows the historical content, and is largely independent even of the most important facts… that research has discovered. It is indeed a curious fact that it is one of the peculiar poetic virtues of Beowulf that has contributed to its own critical misfortunes. The illusion of historical truth and perspective that has made Beowulf seem such an attractive quarry, is largely a product of art. The author has used an instinctive historical sense – a part indeed of the ancient English temper (and not unconnected with its reputed melancholy), of which Beowulf is a supreme expression; but he has used it with a poetical and not an historical object. The great beauty, the real value, of Beowulf is in its dignity of style. In construction it is curiously weak, in a sense preposterous; for while the main story is simplicity itself, the merest commonplace of heroic legend, all about it, in the historic allusions, there are revelations of a whole world of tragedy, plots different in import from that of Beowulf, more like the tragic themes of Iceland. Yet with this radical defect, a disproportion that puts the irrelevances in the centre and the serious things on the outer edges, the poem of Beowulf is undeniably weighty. The thing itself is cheap; the moral and the spirit of it can only be matched among the noblest authors. Tolkien’s counter arguments It is this damning perception which Tolkien sets out to overturn: he succeeded so well that his lecture is cited by every study since as marking a sea change in attitudes. For Tolkien asserted that, far from being the rag-tag miscellany of an immature and juvenile culture, of a poet overwhelmed by silly folk stories and stitching them together willy-nilly – the Beowulf poet was a latecomer, arriving at the end of a mature and full civilisation, after it had been converted to Christianity, well aware of all the old legends and stories, who made a conscious choice to place the monsters at the centre of the poem because they are in fact the quintessence of the old pagan worldview: they encapsulate on a mythical level the evil, unreason and unavoidable death which all men face. Other long Old English poems – eg Andreas, Guthlac – which contain just as dignified and high a style, somehow fail to have anything like the impact of Beowulf – could it be the much-condemned mythical subject matter which gives Beowulf depth and not its peers? Criticism of the triviality and folk-taleness of the plot stem from reducing it to a synopsis, telling the story in outline – a fine methodology for comparative folk tale analysis but disastrous for poetry, which is made out of the texture of the words. The significance of a myth is not easily pinned down on paper by analytical reasoning. It is at its best when it is presented by a poet who feels rather than makes explicit what his theme portends; who presents it incarnate in the world of history and geography, as our poet has done. Its defender is thus at a disadvantage: unless he is careful, and speaks in parables, he will kill what he is studying by vivisection, and he will be left with a formal or mechanical allegory, and, what is more, probably with one that will not work. For myth is alive at once and in all its parts, and dies before it can be dissected. Far from putting the essential legends of Germanic heroes at the periphery and filling the foreground with triteness, the Beowulf-poet has summarised the essence of the Northern worldview, of a doomed hero with his back against the wall – the exaltation of undefeated will. This is the Northern spirit which receives such stirring expression in the words of Byrhtwold at the battle of Maldon. When we have read his poem, as a poem, rather than as a collection of episodes, we perceive that he who wrote hæleð under heofenum may have meant in dictionary terms ‘heroes under heaven’, or ‘mighty men upon earth’, but he and his hearers were thinking of the eormengrund, the great earth, ringed with garsecg, the shoreless sea, beneath the sky’s inaccessible roof; whereon, as in a little circle of light about their halls, men with courage as their stay went forward to that battle with the hostile world and the offspring of the dark which ends for all, even the kings and champions, in defeat…. lif is læne: eal scæceð leoht and lif somod. So deadly and ineluctable is the underlying thought, that those who in the circle of light, within the besieged hall, are absorbed in work or talk and do not look to the battlements, either do not regard it or recoil. Death comes to the feast, and they say He gibbers: He has no sense of proportion. I would suggest, then, that the monsters are not an inexplicable blunder of taste; they are essential, fundamentally allied to the underlying ideas of the poem, which give it its lofty tone and high seriousness. Yet this theme plainly would not be so treated, but for the nearness of a pagan time. The shadow of its despair, if only as a mood, as an intense emotion of regret, is still there. The worth of defeated valour in this world is deeply felt. As the poet looks back into the past, surveying the history of kings and warriors in the old traditions, he sees that all glory (or as we might say ‘culture’or ‘civilization’) ends in night. The solution of that tragedy is not treated—it does not arise out of the material. We get in fact a poem from a pregnant moment of poise, looking back into the pit, by a man learned in old tales who was struggling, as it were, to get a general view of them all, perceiving their common tragedy of inevitable ruin, and yet feeling this more poetically because he was himself removed from the direct pressure of its despair. He could view from without, but still feel immediately and from within, the old dogma: despair of the event, combined with faith in the value of doomed resistance. He was still dealing with the great temporal tragedy, and not yet writing an allegorical homily in verse. It is the strength of the Northern mythological imagination that it faced this problem, put the monsters in the centre, gave them Victory but no honour, and found a potent but terrible solution in naked will and courage. ‘As a working theory absolutely impregnable.’ So potent is it, that while the older southern imagination has faded for ever into literary ornament, the northern has power, as it were, to revive its spirit even in our own times. It can work, even as it did work with the goðlauss viking, without gods: martial heroism as its own end. But we may remember that the poet of Beowulf saw clearly: the wages of heroism is death. Unlike, say, the Odyssey with its strange, hanging happy ending or the Iliad which ends in media res with the funeral of Patroclus but the war still unconcluded, Beowulf ends with the funeral and burial of the hero and the threatened end of his people, the Geats. Although it manages to have Christian sentiment throughout, the final feeling is of a very modern existentialist view of the world, as cold, heartless, shelterless, where most of us are abandoned to figure out our lives by whatever code or guidelines we can muster. For Tolkien, writing in the 1930s, in the shadow of the Nazis, the heartless Northern view of life must have seemed much more pressing and contemporary than the sweet perfections of the Classic tradition. Traditional oral composition by phrase accounts for an exclamatory lack of syntactic subordination and for the tacking, eddying, resumptive movement of the sense. There is a continual play between the demands of sense ie the syntactic units not to be too far apart – and of the alliterative scheme ie some sets of words fit fluently together regardless of sense and so being grouped together regardless of sense: an accumulation of short stocky phrases. The symmetry of the halves of the line produces balance, antithesis and chiasmos much more commonly than in unrhymed iambic pentameter, and the forward movement is much more impeded than in later English blank verse. The halves of the line are, as often as not, out of the natural sequence of prose or spoken syntax and, as the mind reshuffles the parts of the sentence, the tendency is for the half-lines to move apart; but the alliteration and the stress pattern bind them together. The final impression of the verse in Beowulf is of contrasting energies being held in a rhythmic balance – and this is also the impression of the poem as a whole. We must not view this poem as in intention an exciting narrative or a romantic tale.The very nature of Old English metre is often misjudged. In it there is no single rhythmic pattern progressing from the beginning of a line to the end, and repeated with variation in other lines. The lines do not go according to a tune. They are founded on a balance; an opposition between two halves of roughly equivalent phonetic weight, and significant content, which are more often rhythmically contrasted than similar. They are more like masonry than music. The kenning is a figure of speech in old Germanic or Norse literature which uses two words, one in the genitive or possessive case, to create a periphrasis or roundabout way of describing an object. Thus, in Beowulf, the sea is described as the seġl-rād “sail-road” (1429b), swan-rād “swan-road” (200a), hron-rād “whale-road” (10). (Riddles were a big part of Germanic culture. There are two entire sets of riddles in the AngloSaxon corpus, 90 riddles survive in the Exeter Book. Kennings are a kind of miniature riddle). Pleasure in elaborating – armour God, kings, heroes and some classes of objects tend to have repeatable descriptive phrases cluster round them in apposition. in their gear of grim aspect | going to the hall. On a side note, much of the armour has the image of a boar on it. Not sure if this was a generic symbol of warriors or relates to a particular tribe but, strikingly, boar motifs were found on the armour at the famous Sutton Hoo archaeological site. Elaboration of names Not only are important objects described at length but important people tend to have multiple epithets clustered around them, “a series of synonyms in apposition”. A king or hero will be named and then their position as leader or their family position clarified, their genealogy or their deeds will be summarised in an apposite phrase or two. It bigs them up, it makes them more potent (as, to this day, we give the royal family or eminent soldiers or notable citizens an accumulation of names, titles and awards). It also has a secondary affect, as Alexander points out, of placing everything and everyone within a realistically-conceived world. Characters don’t appear out of nowhere: their names, their deeds, their family and their history are all explained, and this technique is part of what gives to the poem its epic quality of describing a real and objective world. Lord of the Scyldings, | shall learn of your request. Understatement of experience “Litotes is a figure of speech in which understatement is employed for rhetorical effect, principally via double negatives. Rather than saying something is attractive (or even very attractive), one might merely say it is ‘not unattractive'”. A bluff Northern Yorkshire understatement is meant to be a leading characteristic of Norse and Anglo Saxon verse but I found litotes relatively rare in Beowulf. Related to it is the way eloquent verse paragraphs often end with a short, pithy, blunt, ironic comment, like a capstone. the sword was gory; | he was glad at the deed. The last line and a half is the conclusion and climax of 50 lines describing the fight between Beowulf and Grendel’s dam, and very characteristically Anglo Saxon in its sudden laconic brevity: three short, pithy half lines, summing up the action with Nordic indirectness (“the sword was gory”) and understatement of emotion (“he was glad at the deed”). he flew back to the hoard | in its hidden chamber. help in a battle; | his hand was too strong. the effect is of strenuous and untiring eloquence. Known to millions as the author of The Hobbit and The Lord of the Rings, Tolkien earned his living as a philologist, a specialist in Anglo Saxon, Middle English, and medieval Norse and German at Oxford University. His core activity was establishing the meanings of Anglo Saxon and Norse words which often exist only in a handful of forms, in a handful or only one manuscript, identifying where scribes and copyists made mistakes (as they often did), establishing their cognate forms in other early medieval texts, languages and dialects, with the ultimate aim of establishing ‘good’ texts. For 40 years, from the late 1920s to the early 60s, he lectured and wrote about all aspects of Anglo Saxon (and its cousin, medieval Norse) literature. The 3,000 line Old English ‘epic’ Beowulf contains quite a few references to the collective history of the north European Germanic tribes of the Dark Ages; the stories of various heroes of legend are told within the poem by the bards who populate the various kings’ halls (Hrothgar the Dane, Hyglac the Geat), but always quite allusively – the audience who heard these poems knew the stories extremely well; the pleasure was in the way the poet shaped and formed them. After Beowulf fights and defeats the monster Grendel in Heorot, the meadhall of King Hrothgar the Dane, the king’s bard sings in celebration a brief summary of the story of Finn, Hnaef and Hengest. The ‘Episode’ as it’s called, lasts only 100 lines before the plot moves swiftly on, leaving a number of unresolved queries in its wake: what happens at Finn’s hall? Why is there a fight at all? Who exactly is it between – Danes and Frisians are mentioned, so where do the Jutes come in? Why does Hengest replace Hnaef as leader of the Danes? Is Hengest even Danish or some kind of exile or mercenary? Has he got anything to do with the Hengest who the Venerable Bede records as leading the Jutes who invade and start to settle Kent in 449AD? Why does Hengest decide to stay, along with the Danish warband, under the hospitality of the Frisian King Finn for an entire winter after Finn and his men have treacherously attacked them? As chance would have it, and it really is the randomest of lucky chances, in the 1700s a scholarly vicar, George Hickes, published a fragment of Anglo Saxon verse he had found on spare sheet of manuscript in the Archbishop of Canterbury’s library. The sheet has since disappeared. All we have is his transcription, riddled with mistakes. But it is a fragment (starting and ending in mid-sentence) which seems to come from the story of Hnaef and Finn and seems to describe in hectic immediate style the start of the dramatic fight at Finn’s hall. This text has become known as the Fight at Finnsburg, also known as the ‘Fragment’. When Tolkien died he left a vast amount of papers, published and unpublished, scholarly or part of his great imagined world of Middle Earth. His son, Christopher, has dedicated his life to establishing order and publishing definitive versions of these texts (hence, for example, the 12 volumes of the stories of Middle Earth). 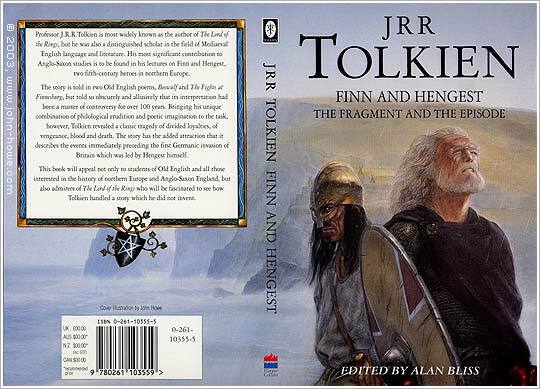 Over his career Tolkien lectured and speculated repeatedly about the relation between the Fragment and the Episode (which has also attracted a huge amount of attention from other scholars of the period). 1. Glossary of Names A very detailed consideration of the origin, meaning, other citings and interrelations of all the proper names used in both the Fragment and Episode: Hnaef, Healfdene, Scylding, Hengest, Finn. You get a good flavour of just how complicated it is trying to establish order and consistency from the wealth of fragments and references to names which differ in every citation and from language to language, in the Wikipedia article about Hrothgar, lord of the Danes, whose meadhall Beowulf visits and protects from the monster Grendel. In that case read hreosceorp (pl.) unhror. Unhror does not else occur, and hror is usually applied to persons – its sense is ‘valiant, mighty’ (but etymologically ‘active, agile’). Neither of these is a fatal objection to weapons. Cf. fyrdsearo fuslic (B.2618) ‘gallant’. The classic example is cene ‘noble’ – ‘bold’ – ‘sharp’. The accentuation héresceorp un| hrór (Type E) is not unprecedented: cf. se þe unmurlice | madmas dæleþ (B.1756), þæt is undyrne | dryhten Higelac (B.2000). Technically as a “noun-compound”, un- should have the accent, but in spite of the additional logical reason for accenting the negative un- it was clearly often unaccented (like ne) – owing partly to the influence of the simplex and partly to sentence-rhythm. It is often in origin an IE unaccented form. Cf. “the ùnknown warrior”, “into the ùnknown”; cf. also ON ó– accented, ú– unaccented. If you’re looking for hobbits, forget it. The whole book is written like this. Finn is king of the Frisians., a border people caught between the powerful Franks to the south, Danes to the north. He has married Hildeburh, sister of king Hnaef of the Halfdanes, probably in an attempt to patch up some feud between them. The Halfdanes are probably a family or tribe on the edges of Danish royal influence proper, types of colonists. The Frisians are an ancient tribe recorded by the Romans as far back as the first century. Hnaef Halfdane takes 60 thanes to visit Finn; this half Danish, mixed nature of his following explains why a number of his followers appear to be Jutes from the Jutland peninsula. Presumably he was visiting his sister; probably he was bringing back Finn’s son who he had been fostering as per northern Germanic custom. He planned to spend the winder with Finn, his brother-in-law. It seems that Hnaef the half-Dane, with Jutes among his retinue, arrives at Finn’s hall/stronghold to find there are a number of exiled Jutes there who have fled some internal Jutish feud. There is very bad blood between the Jutish contingents. The atmosphere is tense. The half-Danish contingent, housed in the guests’ hall, that night notice shields and armour creeping up on them in the night. This is where the Fragment starts with the first assault on the hall: Hnaef despatches men to guard the two doors; Garulf among the attackers falls; they fight for five days, with the attackers suffering grievous casualties, when an attacker turns to his king (Finn?) to say his armour is packing up, the king replying, How are the two others (presumably the pair of defenders defending the door) doing…? The Episode starts with queen Hildeburh surveying the carnage “when morning came”. King Hnaef of the defenders has been killled. So has Hildeburh’s son by Finn (the assumption is that he had been sent as a ward to the court of Hnaef, had therefore slept with the half-Danes, had for some reason been forward in the defence and so killed). But Finn has suffered more with most of his thanes killed in the assault. Therefore he is forced to make a peace treaty with Hengest, who has succeeded Hnaef as leader of the guests. In it Finn promises to call off the attack, lease them the hall for the winter, give them as much gold and rings as he usually gives his Frisians; so that they in every way become his subjects. The treaty agreed, many of the Frisians return to their homesteads leaving Hengest and the half-Danes to winter with Finn. Hengest broods all winter long on the conflict between his duty to avenge his dead leader Hnaef and the peace treaty he has agreed with Finn. In the spring the sea thaws and a number of the half-Danes sail away to Denmark, taking the tale of the treacherous attack on them and the murder of Hnaef. They return with reinforcements. One of the half-Danes places a well-known sword in Hengest’s lap and the next thing we know Finn is dead, his hall burnt down, and the half-Danes have taken queen Hildeburh and all Finn’s gold back to their native land. a) historically, it captures an important moment in the troubled tribal wars of the North Sea and Baltic, one which seems to have crystallised certain shifts of power towards the Danes, against the Frisians and which, importantly for the later English tribes, prompted Hengest’s mission to Britain. b) culturally, it deals with the classic dilemma explored again and again in the Icelandic sagas: Hengest’s conflict between the prime duty to avenge a murdered lord and some other duty either of marriage or, as here, a sworn treaty. c) of its psychological complexity: almost certainly Finn didn’t initiate the attack on the half-Danes, his Jutish guests did and he found himself dragged in to fight against his wife’s kin; he sees his own son killed; he himself dies and loses everything. It is a very Northern, bleak outcome. But also the wrecca or adventurer Hengest didn’t expect a fight, and probably finds leadership of the survivors thrust upon him. His ethical dilemma (described above) is at the centre of the Episode. And queen Hildeburh is a victim like Hecuba or Andromache; through no fault at all of her own seeing first her son then her husband killed, her marriage hall going up in flames and herself taken like booty back to her homeland with ashes in her mouth. She is a character worthy of Greek tragedy. Fight at Finnsburh occurs about 452. Hnaef aged about 30 dies. Hengest the king’s thegn is 25. Hildeburh, Hnaef’s sister, older than him, 33, so as to have a son old enough to fight (and die) 15? 453 Hengest, victorious in the fight at Finnsburh, but with all sorts of enemies, leads a war band along with Horsa in the invasion of Kent. He has an infant son Oesc. Horsa is killed in battle soon after. 470 Oesc becomes a warrior. 473 last mention of Hengest, in a chronicle. He probably lives to old age. 480 Hygelac of the Geats born. 490 Kingdom of Kent established with Oesc as head of the new royal line. 495-505 death of Healfdene Scylding; accession of his second son Hrothgar aged 35 or so. 512 death of Oesc, recorded in Chronicle. 520 Beowulf, aged about 20, travels from the court of King Hygelac of the Geats to visit Heorot, hall of King Hrothgar of the Healfdenes. Fights Grendel and her mother. 525-30 death of King Hygelac in a battle with the Franks, as recorded in Gregory of Tours’ Historia Francorum. 570 the aged Beowulf sets out to battle the dragon who is terrorising his people. Dies and is buried beneath a great mound by the sea. I am not scholar enough to criticise the contents of this book in detail. The editor, Bliss, keeps up a steady stream of footnotes pointing out where Tolkien’s theories are out of date or wrong. And the book was published in 1982 – who knows what further discoveries and insights have been published in the past 30 years? It is a big effort to read this book, but working through all 150 pages of Tolkien’s densely argued notes really takes you into the guts of the text with all its possible variant readings and interpretations. Even an amateur like myself comes away with a much more vivid feel for the complexity of the texts, for the power and beauty of the poetry, for the pathos of the central characters, and excited by the tantalising crossovers with actual recorded historical events. The only criticism I can confidently make is that the book should have included the text of the poem Widsith. This 140-line Anglo Saxon poem is a lament by a wandering minstrel for the courts and kings he has known and performed for: some are clearly fantasy (Caesar, the king of the Egyptians) but others are highly factual references to real kings of Germanic tribes. Early in the poem he refers to Hnaef and Finn, lines Tolkien includes in his list of four sources of evidence which he will consider. It would have been easy and very convenient for the reader trying to follow the repeated references to Widsith if the book had included the full text and a decent prose translation of it. Anglo-Saxon poetry offers a range of pleasures which can, perhaps, be arranged in a hierarchy. First, there is the pure pleasure of the sounds – the tremendous compacting of meaning into abrupt gutteral syllables compressed into short alliterative lines which sound great when recited aloud. They nakedly convey the pagan energy from the origin of our speech which usually lies hidden beneath layers of mellifluous Norman French, Latin and all the other languages we’ve rifled and pillaged. There is a sonic purity which is reinforced, the more you understand the history and subject matter, by a kind of ideological or historical sense of primalness. There is the art and style: as you practice you gain a deeper understanding of the skilled use of alliteration, the division of sentences into compact semantic units or stock phrases (“hard under helmet”), the laconic understatement (“the blow was not welcome”), the pleasure of deciphering riddles or kennings. Poetry which manages to convey sensitivity to the sad plight of fallen humanity with tremendous energy and virility. It assumes a very masculine worldview, one of continual physical competition, bravery and strength in contests and fights. Because so little survives – only 30,000 lines of poetry, of which Beowulf comprises 10% – and most of which has survived by the slenderest of threads, there is a strong sense of the preciousness and uniqueness of what we have. 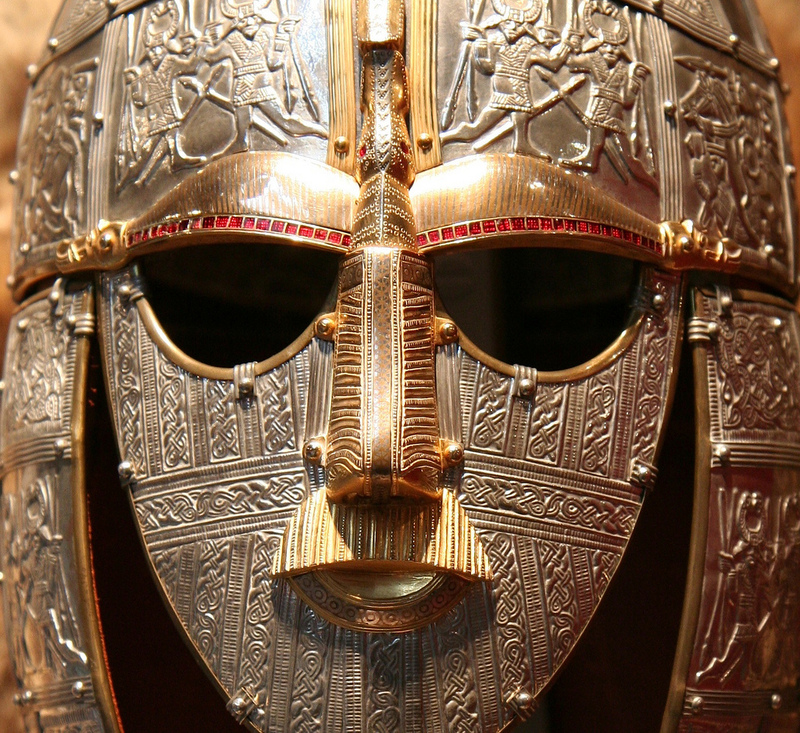 There is a close analogy with the Sutton Hoo treasure, enormously rich in itself but indicating by its very richness – like Beowulf – the enormity of what has been lost. Then there is the very academic pleasure of studying and trying to understand a dead language. But not one like Latin or ancient Greek which were kept alive by scholars through the Middle Ages and Renaissance and then widely studied as a sign of culture in the Victorian period and beyond. Anglo Saxon has always been a tiny minority pursuit (oddly, since it is the origin of the most successful language on the planet). Yet the more you study, the more you enter the treasure house of a lost world.